Henhouse Pottery: Which clay? I'm confused! Yesterday was spent milling about and checking the kiln every hour or so. The firing took around 12 hours and reached cone 10 at around 11:30 last night. I'd previously had problems getting to this temperature - the kiln always seemed to stall at around cone 8 or 9. I ended up emailing Simon Leach, who advised me to raise the bottom shelf off the kiln floor and create a little 'tunnel' to improve the airflow around the kiln. This seems to have worked. I wasn't as excited as usual about this firing, as it was through necessity. 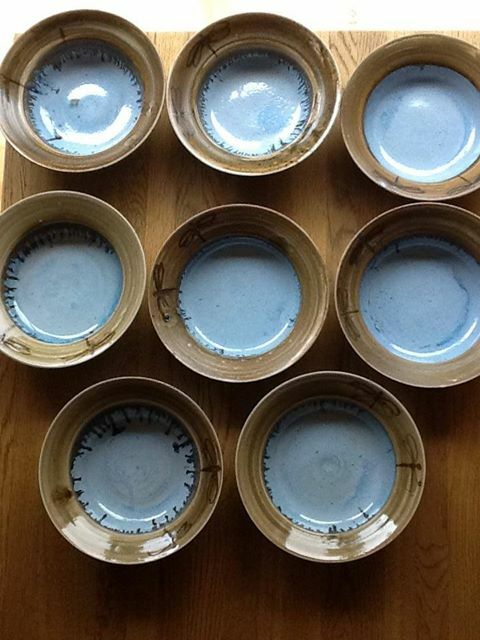 I'd promised a customer a set of soup bowls and the original ones hadn't fired well and so this was attempt number 2. To ensure success I made twice as many as she'd ordered. As a result the kiln was full of these and very little else. 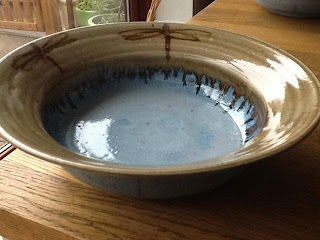 The bowls were ok...I'm not delighted about the firing results, but it wasn't a disaster. The thing is, I'm getting bored of using the same glazes. Over the past few weeks I've subscribed to a few potter's blogs and they've really inspired me. I want to make my work more attractive and I really want to do more sgraffito and slip decoration. To get the results that I want I'm going to have to change the clay that I use. I've been using a white stoneware clay that's great for throwing. It's smooth and very plastic and over the past couple of years I've learned it's limitations. To achieve the results that I now want I'm going to have to change to a red clay. I'm beginning to feel a little bamboozled by the options available. Do I need a terracotta clay? Should I change to earthenware? Will I need an electric kiln? A lot of the potters that I admire - Doug Fitch, Margaret Brampton, Hannah McAndrew to name but a few (...there really are loads), use red clay, which I assume they fire to earthenware temperature? If so, are their pots porous ie. are they functional? I'm relatively new to all this and I'm having to learn fro the snippets of info I find on the web. It's a slow process, with lots of mistakes, and lots of trial and error.